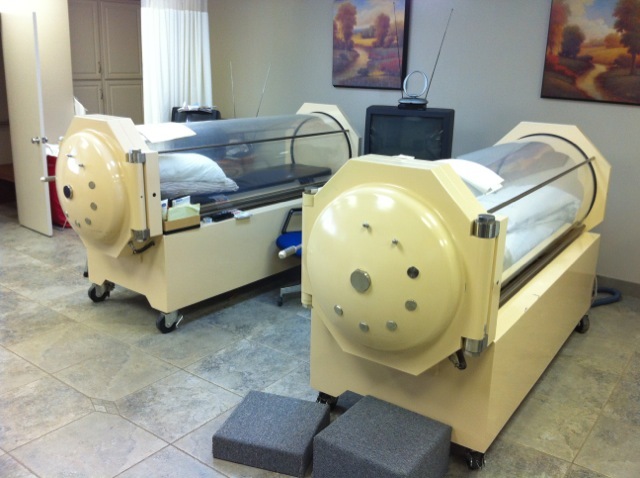 Hyperbaric Oxygen Therapy (HBOT) is a technique we have been doing for almost 27 years at McDonagh Medical Center. It is a technique in which we place a patient in a sealed chamber (see picture of a chamber to the right) and increase the pressure to a level that is up to twice the normal atmospheric pressurre. The net effect of this is that we can drive or force oxygen into the liquid part of the blood called the plasma and since this liquid can go farther into an artery and cells than a red blood cell (which usually carries 98% of the bodys oxygen) can go. We can deliver oxygen to once unreached tissues and save them from dying wile we are waiting for the circulation to be restored. We have written an informative pamphlet entitled, Hyperbaric Oxygen Therapy. If you would like to go to the pamphlet and read about prolotherapy simply click on the book. On the other hand, if you have questions about HBOT, please scan the questions below and you will be transferred to an area that will provide you with a, sometimes illustrated, answer. Hyperbaric oxygen therapy (HBOT) is a medical therapy using 100% oxygen, administered at greater than normal atmospheric pressure, for the treatment of specific disease conditions. The route of administration may be by means of a mask, head tent, or endotracheal tube in a compressed air chamber or in a monoplace chamber completely pressurized with oxygen. Hyperbaric oxygen therapy is simply intermittent, short-term, high dosage oxygen therapy. The patient is generally placed in a specially designed chamber and the oxygen is administered either by means of a mask or directly into the chamber. A hyperbaric oxygen chamber may vary in size from a small one-person unit to a large multi- place unit capable of housing an entire surgical team. What is the History for Using HBOT in Medicine? The use of hyperbaric systems in the treatment of disease is not new to the field of medicine. The British physician Henshaw is said to have been the first to use compressed air in a specially equipped room called a domicilium about the year 1664. His facilities were crude and his results are unknown. He believed that his contraption promoted good health by improving digestion and respiration. During the next two centuries, a variety of experiments were conducted by English, French, and Dutch workers using various types of diving apparatus. One important development during this early period was the discovery of oxygen by the English chemist Joseph Priestly in 1771. The early physiological studies of Paul Bert (1833-1886) on the barometric pressure effects on animals and man gave considerable impetus towards establishing a scientific basis for clinical HBO. Although numerous investigators were involved in one aspect or the other of what might be loosely termed hyperbaric medicine, one of the most serious clinical studies was conducted by the French physician J. A. Fontaine in 1879 at which time he constructed an operating room which provided hyperbaric conditions. The hyperbaric chamber was a mobile unit, placed on wheels, and used a manually operated compressor. During this period hyperbaric chambers met with a great deal of enthusiasm in Europe, and then gradually the interest waned. The reasons for this demise of hyperbaric medicine are still not clearly understood. About the time that hyperbaric medicine in Europe was on the decline, interest in this new area of medicine started to catch on in the United States. The first hyperbaric chamber for therapeutic use on the North American continent was built and used in 1860 in Oshawa, Canada. The first chamber in the United States was in Rochester, New York, in 1891. Noteworthy in the early American scene was the work of Dr. Orval J Cunningham, who was probably one of the foremost of the American investigators. With the financial backing of Henry H. Timken of roller bearing fame, Dr. Cunningham constructed the largest hyperbaric chamber ever built, a steel sphere, 64 foot in diameter, containing 36 rooms, and with the usual amenities of a hotel. As a result of the depression, opposition by the American Medical Association, and a series of other unfortunate circumstances, Dr. Cunningham’s project was ultimately scrapped. The history of hyperbaric medicine over the years has been an up and down affair; but after World War II with an intensification in diving medicine and other submarine activities, hyperbaric medicine has achieved respectability and the scientific stature which it deserves. A recent upsurge in hyperbaric oxygen therapy followed the work of the Dutch surgeon I. Boerema and his associates who in 1956 began using it in cardiac surgery. Serious interest in the broad therapeutic applications of hyperbaric oxygen therapy started in the United States about 1961. In September 1961, the First International Congress on the clinical application of hyperbaric oxygen was held in Amsterdam. The Second International Conference on HBO was held in Glasgow in September 1964. In general, this meeting concentrated on the basic physiological mechanisms of HBO. The Third International Congress was held at Duke University at Durham, North Carolina, in November 1965. The Fourth International Congress was held in Sapporo, Japan, in September 1969. The Fifth Congress was held in Vancouver, B. C. in 1973. The Sixth Congress was held at the University of Aberdeen, Scotland, in August 1977. The next International Congress was held in Moscow in 1981. These Congresses presented an extensive series of investigative reports dealing with basic physiology, oxygen toxicity, animal experiments, and a broad spectrum of therapeutic applications of HBO to human disease, viz. : actinomycosis, air embolism, burns, carbon monoxide poisoning, cerebral vascular impairment, crush injuries, cyanide poisoning, drowning or asphyxia, electrocution, gas gangrene, gastric ulcer, head injuries, intestinal obstruction, myocardial infarction osteomyelitis , peripheral vascular disease, pulmonary insufficiency, senility due to cerebral insufficiency, sickle cell anemia crises, skin grafts, skin ulcers, smoke inhalation, stroke, and in certain other disorders where oxygen impairment is a causative factor. Unfortunately hyperbaric chambers are quite costly to construct and to operate, and limited in their distribution. Hyperbaric chambers are presently maintained by the U. S. Navy, U. S. Air Force, U. S. Army, NASA, Veterans Administration, and a number of universities and larger medical centers. Most of the hyperbaric oxygen units are involved in clinical investigational studies or are used for special purposes and are frequently not available to the general public. Hyperbaric oxygen therapy accomplishes its beneficial results by means of the basic respiratory functions of the body. A simple explanation of respiration is as follows: The air we breathe is comprised of oxygen, 20.96%; carbon dioxide, 0.04%; and nitrogen, 79%. When air is breathed into the lungs about one- fourth of the oxygen passes into the blood and is replaced in the expired air by an equal amount of carbon dioxide. The expired air contains about the same amount of nitrogen as the inspired air. Thus, nitrogen serves largely as a bulk vehicle for oxygen and carbon dioxide. This process of breathing is referred to as external respiration. As a person inhales, the air enters the lungs and is drawn into minute microscopic air sacs known as alveoli. The walls of these alveoli are ultrathin and are in immediate contact with the capillary blood vessels. The thin walls of the alveoli and the capillaries are semi-permeable and permit the rapid passage of oxygen and carbon dioxide between the lungs and the blood stream. Under normal circumstances oxygen is transported in the blood only by the hemoglobin in the red blood cells. Oxygen molecules have such an affinity with the hemoglobin in the red blood cells that the hemoglobin is always about 98% saturated with oxygen. However, a fact of importance in hyperbaric oxygen therapy is that the red blood cells constitute only 45% of the blood volume, and that the colorless plasma transports very little oxygen under normal atmospheric pressure. The transport of oxygen by the blood from the lungs to the tissues is due mainly to the ability of hemoglobin to combine reversibly with oxygen. The exchange of these gases between the blood and other tissues or organs of the body is sometimes referred to as internal respiration. Finally, the respiratory process also involves the cells of the body which make up the various tissues, and this phase of the process is known as cellular respiration. Respiration is essential for life. All living cells require oxygen to carry out their necessary functions. These functions cease when oxygen is no longer available. The cells of the body produce carbon dioxide as a waste product. Oxygen is required to produce energy in the cells of the body, and in so doing there is a chemical exchange resulting in the production of water, heat, and carbon dioxide. The carbon dioxide is released into the veins to be carried back to the lungs to be exhaled. When you take your next breath, this complex respiratory cycle is started all over again. What Does the Doctor Mean when They Prescribe 1 or 2 Atmospheres? There is another aspect that must be considered on and beyond the usual physiological role of oxygen in the body. This other aspect relates to the delivery of oxygen to the body under hyperbaric pressures. The term hyperbaric literally means high pressure. A person living at sea level is at one atmosphere of air pressure absolute (ATA). This can be expressed as 760 mm (or 29.9 inches) or mercury, or 14.7 pounds per square inch of air pressure. These numbers express the weight (or measure) of the vast envelope or “ocean” of air that surrounds the globe. We live at the bottom of this air layer. This air pressure is not noticeable because it is equally distributed over the body. Because of the various physical laws governing temperature, pressure and volume of gases, it was discovered that if the partial pressure of oxygen coming in contact with alveolar capillaries was increased there was a corresponding increase in the amount of oxygen that will be forced into solution in the blood. Since the hemoglobin of the red blood cells is already 98% saturated, the only place the additional oxygen can go is in the plasma. At one ATA* of pressure (the standard air pressure or sea level), the partial pressure of oxygen in alveolar air amounts to about 673 mm of mercury (mmHg). However, when a person is placed in a hyperbaric chamber and delivered pure oxygen at 2 atmospheres (ATA)1 (or 1520 mm of mercury) the alveolar oxygen pressure will increase to about 1433 mm of mercury. At 3 ATA or 2280 mmHg the alveolar oxygen pressure increases to 2193 mmHg. Theoretically, arterial and tissue oxygen pressure closely follow alveolar oxygen pressure. This is a dramatic increase in the amount of oxygen going into the blood. When the body is at rest, it normally consumes about 6 ml of oxygen per 100 ml of blood, but of this amount only 0.3 ml is transported by the hemoglobin in the red blood cells. When the hyperbaric pressure is raised to 2 ATA of pure oxygen, the plasma oxygen is raised to 4.4 ml. Thus, oxygen saturation of the tissues is considerably enhanced with the use of hyperbaric oxygen therapy. At 3 ATA approximately 6.4 volumes per cent of oxygen are physically dissolved in the plasma, which is sufficient to sustain life even in the absence of hemoglobin. *ATA is a term used to define the amount of pressurization used within a Hyperbaric Oxygen Chamber and refers to Atmospheres of pressure. Absolute: In a space where a vacuum exists the pressure is spoken of as zero Atmospheres Absolute. At sea level the air pressure is one Atmosphere Absolute. What Laws of Chemistry Make HBOT Possible? The clinical use of H80 therapy is governed to a great extent by physical gas laws interacting with biological systems. Dalton’s Law of Partial Pressures: The total pressure is the partial pressures of the two components gases,(Pt =P1+P2) that would be exerted by each of the gases if it alone was present and occupied the total volume. Henry’s Law: The degree to which a gas enters into physical solution in the body fluids is directly proportional to the partial pressure of the gas to which the fluid is exposed. However, the absolute amount of gas entering solution is determined by its solubility coefficient. The solubility coefficient varies with the fluid, and is temperature dependent, with the solubility inversely proportional to the temperature. Thus, the combination of H80 with hypothermia is advantageous because more oxygen can be dissolved than at normal body temperature and the metabolic demand would be reduced. Boyle’s Law: If the temperature remains consant, the volume of a gas is inversely proportional to its pressure. Therefore, at 1 ATA the volume in a cavity is at 100%, at 2 ATA at 50%, and at 3 ATA at 33.3% (Table 1). What is a Monoplace and Multiplace Chamber? There are two types of Chambers: Monoplace that holds a single person and Multiplace which is a large chamber where 5 or 6 patients (hence the name multiplace) can be treated at once. The Muliplace Chamber is difficult for many elderly, disabled and children because the Oxygen is delivered by wearing a mask and the chamber is pressurized with room air. The Monoplace chamber is about 8 feet long and about 3 feet in diameter, permitting only single occupancy and is pressurized with oxygen. The patient is moved in and out of the chamber by means of a sliding stretcher cart with which it interlocks. The chamber walls are of clear heavy duty acrylic plastic. This plastic provides the patient with almost unlimited visibility and helps to reduce the feeling of claustrophobia. A communication system is provided which permits the patient to communicate any discomfort to the operator, and helps to reduce confinement anxietyy. The temperature within the chamber can be easily controlled. The monoplace chamber can be operated from the usual hospital oxygen supply system, bottled oxygen, or from a cryogenic system. Monoplace chambers are ideally suited for the treatment of most chronic conditions. Removal from a monoplace chamber can be accomplished is less than one minute. A good monoplace chamber is safe, easy to operate, and provides a 100% oxygen delivery system to the entire body. At the Clinic we have two Monoplace Chambers as can be seen to the side. Is Oxygen Toxic in these High Doses? Oxygen for all practical purposes can be considered as a drug, and is capable of producing toxic effects. Just as in most other drugs, oxygen administration follows a dose response curve. Too little oxygen can be lethal, just as too much can be toxic and produce death. Unfortunately, the precise mechanisms involved in oxygen toxicity are not completely known. However, it is believed that the cause of oxygen toxicity is probably due to the increased formation of superoxide, H2O2 or other oxidizing free radicals. It is believed that the major elements attacked are sulfhydrl-containing proteins, lipoic acid and coenzyme A. The end result is damage by means of excessive oxidation of intracellular membranes and other essential cellular constituents. Oxygen poisoning may also affect the central nervous system, causing muscle twitching and grand mal convulsions. Continued exposure after the onset of these symptoms can result in paralysis and even death. Untoward effects can also involve the eye, causing retinal damage and blindness. Other toxic effects have been described involving heart muscle, liver, and the endocrine organs. One of the characteristics of oxygen poisoning is that the early effects are completely reversible. However, toxic effects of oxygen poisoning are generally the result of prolonged exposure at high pressures, generally greater than 3 ATA. This is one reason that most HBO treatments are given at 3 ATA or lower for periods of time not to exceed 2 hours. Under these conditions only the beneficial effects of HBO treatment are realized. Further protection from hyperbaric oxygen toxicity is provided by maintaining adequate nutritional support of glutathione peroxidase, vitamin E (d-alpha- tocopherol), selenium, and vitamin C.
How Can I Tell if I am a Candidate for HBOT? The eligibility of a patient for HBO depends to a large extent upon the seriousness of the illness and the critical need for such therapy. In emergencies, such as gas gangrene or gas embolism, inability to clear the ears can be managed by tympanostomy, and pneumothorax can be handled with a chest tube that is carefully vented during decompression, if a multiplace chamber is used. Elective patients, such as in osteomyelitis, osteoradionecrosis, burns, wound-healing problems, senility, etc., should be instructed as to the nature of the therapy. Elderly patients should have a pulmonary function test. If significant obstructive pulmonary disease is present it will require very slow rates of decompression, such as one foot per minute or less. The patient should be examined to make certain that the patient can equalize middle ear pressure, Decongestants can be used, and when necessary, polyethylene tubes can be placed in the tympanic membranes for the duration of the treatment. What Conditions Do You Treat with HBOT? 4. Carbon Monoxide and cyanide poisoning. d. Bone and skin graft enhancement. HBO has been found to exhibit antimicrobial properties on a broad range of microbial organisms. HBO has been found to be useful in the treatment of Hansens disease (Leprosy) and tuberculosis. However, each bacterial infection must be carefully considered, because in some instances hyperbaric pressures may enhance the infection. HBO has also been used in the treatment of multiple sclerosis, myasthenia gravis and senility (including Alzheimers disease) as an adjunct to nutritional measures with varying degrees of success. The use of HBO in cancer therapy is a matter of controversy. The rationale for the use of HBO in cancer therapy is based on the concept of Otto Warburg and others that anaerobiosis (oxygen deficit) is one of the characteristics of malignant growth. When hyperbaric oxygenation is administered at high pressure levels (above 3 ATA) and oxygen toxicity is present, cancer growth may be enhanced due to free radial pathology. If HBO is being used in cancer therapy it should be used cautiously at low levels (below 3 ATA) and should be for short intermittent periods of time. Disagram illustrating the metabolic dysfunction of the arterial wall in atherosclerosis. The use of EDTA and HBO helps to reverse a vicious metabolic cycle and restores enzyme function of the arterial walls. A new therapeutic approach has been instituted using chelation therapy with HBO for the treatment of atherosclerosis and its clinical manifestations of senility due to cerebral vascular insufficiency, stroke, heart disease, and peripheral vascular occlusive disease. The clinical therapeutic results have been most encouraging. Atherosclerosis involves a build-up of calcium complexes of mucopolysaccarides, lipoproteins, elastin and collagen in the arteries. This results in the development of insoluble substrates which tend to depress a number of enzyme systems concerned with the oxygenation and energy mechanisms of the arterial wall. The end result is a state of hypoxia in the arterial wall which encourages further calcification. Chelation therapy is a form of treatment aimed at reducing calcium deposits in the arteries and reversing some of the degenerative processes in the body. The treatment involves injecting small amounts of a synthetic amino acid, disodium ethylenediamine tetraacetic acid (EDTA), into the blood stream. This amino acid has the unique and valuable property of being powerfully attracted to ionic calcium. When EDTA comes in contact with ionic calcium in the body, it binds itself to it. The EDTA-calcium complex is then excreted through the kidneys into the urine and through the liver into the intestinal tract, and finally passes out of the body. This binding property of EDTA provides the basis for chelation therapy. Figure 1 represent how EDTA helps out in the cycle. The word chelate is derived from the Greek chele which refers to the claw of a crab or lobster, describing the firm, pincer-like binding of certain chemical substances to a bivalent metal or some other mineral. Chelation is specifically defined as the incorporation of a metal or a mineral ion into a heterocyclic ring structure. Certain chemicals are used in chelation to grasp metals or calcium with this claw-like action so that these elements are encircled or sequestered by a complex ring structure, thereby losing their physiologic and toxic properties. Thus when chelation takes place calcium or some other metal ion comes in contact with the chelating agent (EDTA), becomes imprisoned in the EDTA molecule, and is then excreted from the body in a bound and inert form. 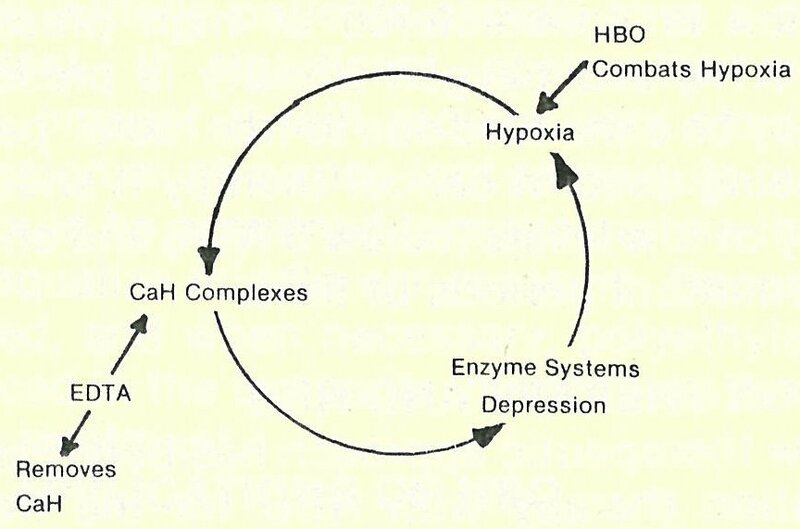 The purpose of the HBO is to increase oxygen to oxygen-starved tissues. By removing ionic calcium with EDTA and providing oxygen with HBO the deranged metabolic processes of the arterial wall are reversed and enzyme function is restored. Do I Need Tests Before I Can Start HBOT? Before either chelation or hyperbaric oxygen therapy can be started, the patient must be carefully evaluated. This entails a comprehensive history and physical examination, various laboratory tests, and a series of other diagnostic procedures in order to determine the general health status of the patient. In the case of senility it is important to determine the extent to which brain damage has resulted. No treatment can restore dead brain cells. Persons suffering from chronic sinusitis, seizure disorders, emphysema, uncontrolled high fever, history of ear surgery, spontaneous pneumothorax, asymptomatic pulmonary lesions, and viral infections are frequently not acceptable for hyperbaric oxygen therapy. However, final determination of the acceptability of the patient can be determined only after careful clinical examination of the candidate by the physician. How Does HBOT/Chelation Compare with Surgery in Arteriosclerosis? Hyperbaric Oxygen Therapy is employed by metabolic physicians primarily for the treatment of atherosclerosis and related disease conditions, i.e., senility, stroke, peripheral vascular disease, and heart disease. The question is frequently raised as to whether or not there are other forms of treatment for these disorders. In some cases – yes. In other cases, such as senility involving cerebral vascular insufficiency, there is no treatment generally practiced today in the United States that offers as much promise as the combined chelation-hyperbaric oxygen therapy. In the case of atherosclerotic involvement of the coronary, carotid, femoral and some of the other larger vessels, surgery has been used with varying degrees of success. This procedure involves surgical excision or stripping of the atheromatous intimal lining of some of the larger arteries. By-pass surgery can sometimes be performed on the heart by creating a new vascular blood supply in order to circumvent a constricted or blocked coronary artery. Similar procedures have been used in the femoral arteries in the legs. If there is a severe localized blockage of a major artery, surgery may be the treatment of choice. Surgical procedures may also be needed in some cases for conditions which are unresponsive to chelation-hyperbaric therapy. However, if there is a generalized atherosclerotic condition, surgery may be only a temporary palliative measure. It should be kept in mind that surgery is only effective in those specific sites which are reached by the surgeon’s knife. The surgeon’s treatment extends no further. Chelation-hyperbaric oxygen therapy involves the entire body, including such areas as the brain, which cannot be surgically repaired. Finally, chelation-hyperbaric oxygen therapy is generally safer than surgery, less expensive, and a more rational approach, since it promotes the health of the entire circulatory system, whereas surgery is limited to a single segment of the arterial system.